Max Altitude: 11155 ft base, Kolahoi peak 17799 ft. Destinations: Srinagar, Dal Lake, Pahalgam, Lidderwat, Kolahoi Glacier, Srinagar. Destinations Details: Srinagar, Dal Lake, Pahalgam, Lidderwat, Kolahoi Glacier, Srinagar. Dal Lake is a lake in Srinagar, the summer capital of Jammu and Kashmir. The urban lake, which is the second largest in the state, is integral to tourism and recreation in Kashmir and is named the "Jewel in the crown of Kashmir" or "Srinagar's Jewel". The lake is also an important source for commercial operations in fishing and water plant harvesting. Pahalgam means “A Village of Shepherds“is situated on the banks of the Lidder River, Pahalgam at an altitude of 7,000 feet is a picturesque township. 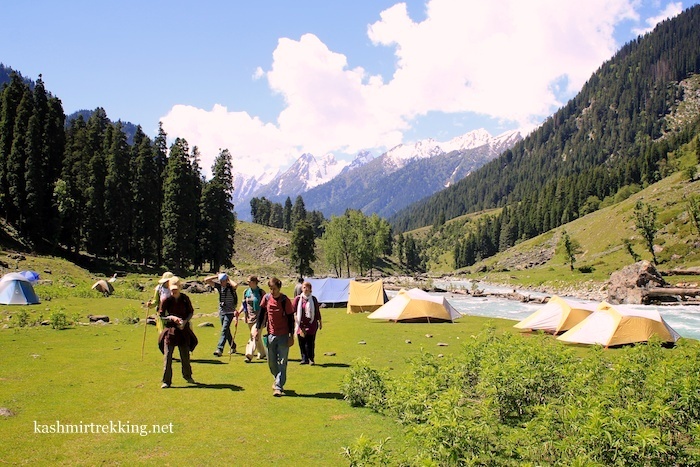 Pahalgam is also the staging point for one of Kashmir's oldest and most popular Kolahoi Glacier Trek. Day 03: Trek from Aru to Lidderwat. Day 04: Trek from Lidderwat to Kolahoi and back to Lidderwat base camp. Day Details On arrival at Srinagar, you will meet our representative at the airport and transfer to Deluxe Houseboat. Afternoon Visit famous Mughal Gardens (Nishat, Shalimar Cheshma Shahi) & Shankaracharaya Temple) & Old and New Srinagar city, overnight stay at Houseboat. Day Details Departure from Srinagar by Jeep (early in the morning) after breakfast to Pahalgam. (2195 m high). 7201 feet. Pahalgam is surrounded by Mulberry trees; you may also do some trout fishing at a river (field stream). From Pahalgam will you go further on till ARU, gradual up the road (10 km long) on your way, you will find lots of trees, pine towers. After this, you will reach green meadows. (Camp - overnight in tent at ARU - 7923 feets) 2415 m.
Day Details A gradual climb in the beginning, (traverse) through beautiful pine forest to Lidderwat. Camp at Lidderwat 8957 feets high 2730 m.
Day Details From Lidderwat to glacier: A gradual 28 km track makes you to return to the base of Kolahoi Glacier (11155 feet’s high) 3400m. Kolahoi peak is in a high of 17799 feet’s 5425 m. Overnight tent. Day 05 Trek from Lidderwat to Aru (11 Kms Trek Ends) Aru to Srinagar drive. Day Highlights Trek Ends Here and Back to Srinagar for Night Stay. Day Details From Lidderwat to Pahalgam. Way down from Lidderwat to Pahalgam (by Jeep) and then, way back to Srinagar. Overnight stay at Houseboat. Day Highlights Package Ends Here. 02 Nights accommodation at Srinagar in Houseboat. 03 Nights accommodation at Mountain in Tents. Meal Plan Breakfast, Lunch, Afternoon tea & Dinner. Free WiFi in Houseboat only. Trek equipment's like Sleeping bag, mattress, tent, kitchen tent, toilet tent, trekking permits, first aid medical kits and oxygen cylinder, qualified & experienced trek Leader, Guide and Support staff.